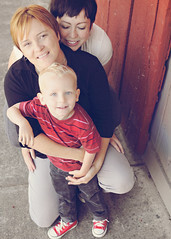 There were many weeks during Caemon’s treatment when Jodi had to go home to teach for a couple of days. It was so hard on all of us, and especially for Caemon. As he started to understand that she would return, he would say on the nights she wasn’t there, “Mommy, an important part of the Marston-Simmons family is missing!” I would agree, and we would try to talk to Mama on the phone, easing his worries a little, letting him know she would be back. It heartened me to know that our family unit was so important to him, and it saddened Jodi and I both that he had to know what it felt like for one of us to be missing for any length of time. When Caemon died, though, the most important part of the Marston-Simmons family was missing, and he has been missing for two long years. Before Caemon, there was no Marston-Simmons family. We were Jodi and Timaree, and while we had been together for eleven years when Caemon made his arrival, we were always a couple, never a family. Caemon made us a family. As he gained more language, he loved calling us the Marston-Simmons family. He was proud to be a part of it. All sorts of things were named for our family. There was the Marston-Simmons Family book and the Marston-Simmons family song. Our family was his world just as he was ours. Since the most important part of the Marston-Simmons family has been missing for so long, we haven’t felt much like a family, even though we most certainly are. We have gone back to being a childless couple, each with our own last name, no small hyphenate to bind us into a familiar family structure. It has been two years of anguish, two years of feeling hollow, two years of missing being a family. But all of that will soon change: I am pregnant with Caemon’s baby sister. 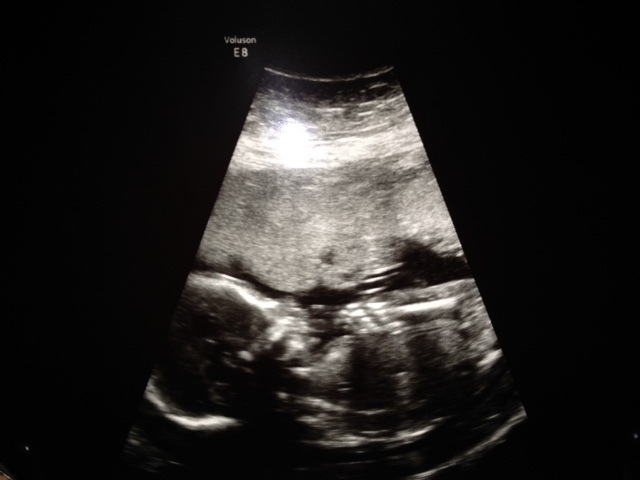 She is due to arrive in late July, and we are so excited to meet her. There is so much wrapped up in having another baby. There is the return to the family structure for which we have so longed, yes, but there is also an awareness that this little girl will not be Caemon. We cannot expect her to be. Of course I hope to see some part of him in her—maybe something of his twinkling eyes, his smile, his laugh—but she may be nothing like him at all, and I’m also ready for that. You see, one of Caemon’s great lessons to me was one of accepting a child for whomever he or she happens to be. By the time I was pregnant with Caemon, Jodi and I had been talking about having a daughter for years. We were both fairly certain we would have a girl first, which made learning that we were having a son surprising to say the least. The beauty of all of that was that our son was just who we needed. Having a boy after all those building expectations of a girl allowed me to let Caemon be Caemon. Jodi and I celebrated who he was, whether that was nurturing and creative, rough and physical, quiet and introspective, loud and opinionated—and he was all of those things and more, and all of those qualities made him perfectly Caemon. I must admit that a year ago, I could not fathom having a daughter. I’m sure that I hoped to have another boy like Caemon. Who wouldn’t want another sweet, articulate, wise, and loving boy like him? But once again, life is handing us the child we need, and once again, I can apply that lesson that Baby Caemon taught me: that first and foremost, we must let this child be whomever she is meant to be, to honor that in her, to love that she is one of a kind–just like her brother. There is so much of this I wish we were sharing with Caemon. I think he would have been proud to be a big brother. I think he would have been amazingly helpful. I think he would have read to his sister, comforted her, loved her, and I know she would have adored him. Instead, we have the task of helping this little girl love and know a brother she will never know while also working to help her have a normal life—as normal as it can be. But most of all, I suppose I have to let go of the fear that comes with having another child—the fear of losing her, the fear that I won’t love her as I loved my son, the fear that somehow she will always live in his shadow. To parent Caemon’s sister, I have to lead with love, just as he taught me for three and a half years. Caemon’s legacy will most assuredly live on in our daughter. And he may live on in her in very real ways. Recently, I have read some mind-blowing articles about fetal cells. Scientists are discovering that during pregnancy, cells from the fetus cross the placenta and into the mother’s blood stream. Their research has shown that those cells may take up residence in the mother’s blood stream, her brain, even her heart. They may act as stem cells and help repair damaged organs, prevent disease, and do a whole host of things that we never imagined. But more than this, it is believed that some of those same fetal cells, the cells of a woman’s prior pregnancies, very likely pass into the woman’s future children. Yes, our little girl may very well carry a physical part of Caemon with her throughout her life. In so many ways, this tumbling, kicking, lively little girl in my belly is her brother’s living legacy. The Marston-Simmons family will always be missing a very important member. We will always wonder how Caemon would have completed our foursome, what sort of big brother he would have been, what sort of grownup son he would have been. We will always have a hole in our hearts and our lives and our family where that boy should be. But we know now that the Marston-Simmons family did not die with Caemon. It couldn’t. What he helped create was the eternal magic of family, a space for two moms to love both of their kids, one in this world and one beyond. This entry was posted in Uncategorized on March 25, 2015 by T.
On one level I have no words, on another I have too many. Sending love and hugs across the oceans to the Marston-Simmons family. That is such fantastic news. I’m so glad that your thirty days of remembrance ends on a high note. Here’s hoping for an entirely uneventful pregnancy and a joyful birth to come. Joy again after sadness. I lost my only son, but I have four daughters. No one can replace the lost one, but the others supply a reason to continue. Unbelievably happy for you. What a gift your family is! What a beautiful way to announce the news of your daughter. 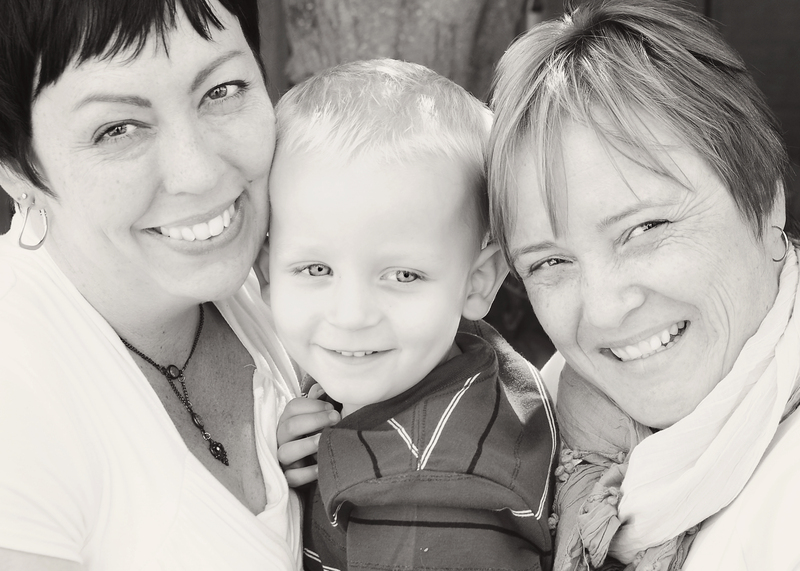 SHE is the lucky one to enter a family with two women who will cherish her. I never comment, but I am just so, so happy for you. Sending much love. While I have spectated your journey for a long while I have never commented before. This makes me need to share with you a piece of wisdom my mother gave me as I was about to have my second child and worrying that I could never love another as I loved my first daughter. She told me that I wouldn’t ever love another like I loved my first daughter, and I wouldn’t love anyone like I loved my second. I would love them each as they were meant to be loved, not one greater or lesser – just differently. And that love never divides, only multiplies. I am so happy for your multiplication! What joy! I think of you often and love that your memories are wonderful and your future so very bright. i am so happy for you. I am so happy to hear the good news! What a journey this has been, and I am grateful that you shared it with all of us. Your example of how to grieve, how to love, and how to move on with life is truly inspiring! So happy for you! This little one is so lucky to be joining your family. What a sweet post. I’m sure Caemon’s baby sister will be a perfect addition. When I saw the sonogram my first thought was a new baby, then I reigned it in and figured it was a picture of Caemon’s sonogram to go with the reflection. I am JOYOUS to learn you have a daughter on the way and my heart sings for all three of you. Blessings, blessings, blessings! I’ve been reading all of your posts, but don’t comment. I couldn’t read this one without speaking up – this was a beautiful way to share your wonderful news. No doubt Caemon helped his little sister pick the best moms in the world. This is so wonderful. I have tears of joy and tears of pain for you two. Your little boy was something special and your little girl will be something special in her own way. God Bless Your Family. All 4 of you! I got chills reading this wonderful news. I know your daughter will continue to help you heal and also help you remember so many wonderful things about Caemon, just by being herself. Congratulations!!! So happy to hear you are expecting Caemon’s little sister. I’m sure he is smiling down with joy and will help watch over her forever! aww, such a great reminder of your lovely and sweet boy, with the welcoming of his baby sister and the ongoing memories that will be with you always. This is wonderful to read. While I cannot imagine the mixture of emotions you must be feeling, I am so happy for you. It is amazing how each baby is his/her own individual from the very beginning, yet how they share traits with their siblings. You will see Caemon in your daughter, and I’m sure he will be right there by your side to watch her grow. The biggest possible congratulations you both, May you all be blessed with only good health, much happiness and beautiful memories for years to come…. I am so thrilled for the Marston-Simmons family! I’ve been reading your blogs since long before Caemon became ill, and I’ve been rooting for you guys! “Caimon helped his little sister pick the best Moms of the world” – what a wonderful thougt. And surely he also picked a perfectly “right” daughter for his Moms! I’m a long time follower but have not commented. So happy and excited for both of you!